This is another example of how to segment a market for a bank– please refer to the other article on segmenting on a customer relationship stage basis for another banking example. 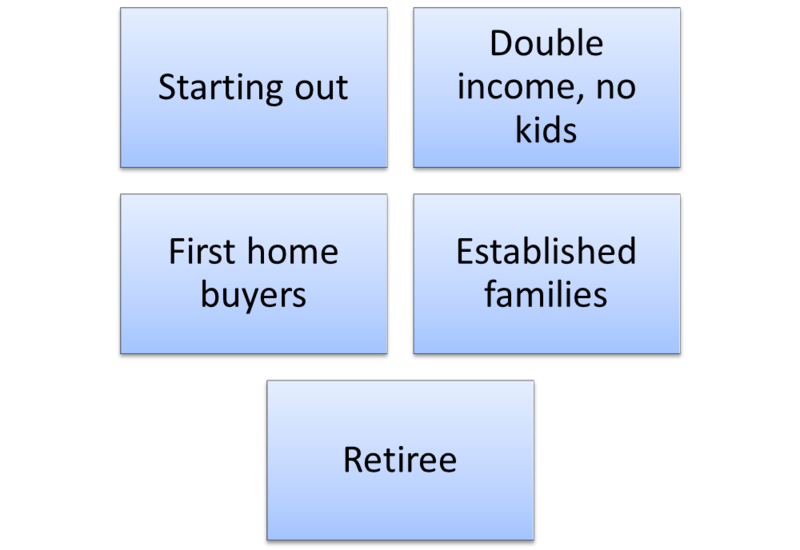 In this market segmentation example, the concept of the family life cycle is used. Family life cycle is the stages that an individual typically goes through over time in their life as they move in/out of relationships and probably start a family. In previous years, the family life cycle was reasonably structured and quite predictable. However, in more recent times, people can go through a variety of life cycle stages depending on the personal situations and changes. The starting out market segment consists of consumers who are typically older teenagers or young adults who are starting out on their career. At this stage of their life, they only have a need for relatively simple financial products, such as the transaction account and perhaps a credit card. From time to time, may need a small loan or will have a small amount of money to invest. In terms of the family life cycle stage, they are either single or not in a serious relationship and usually do not have the need for sophisticated financial products or to make large purchases. The next stage is when the consumer forms a serious relationship or perhaps gets married. This will trigger the consumer’s need to start saving more money, looking for short-term investments or investing in shares and stocks, or borrowing larger amounts to perhaps purchase a motor vehicle or go on a major holiday. At this stage of their life, there are no children in the relationship (which may never happen), which means the couple can continue to rent without the emotional pressure to purchase a house. 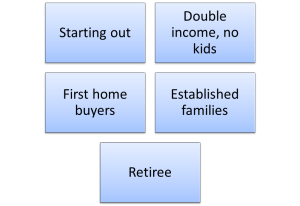 In this family life cycle segmentation example, the first home buyer’s segment consists of those consumers who are usually in a serious relationship or married and now have young children. It is when families to start a family that their financial needs significantly change, indeed many of their regular purchases also change significantly. This life-cycle change is quite important for a bank as the young family is usually more motivated to purchase a home, which will transform the customer from being a low-value customer to a medium or high-value customer through one large loan transaction. The established families segment has older children and usually have both parents working, either full or part-time. At this stage of their lives, they are starting to build some wealth or significantly pay off their home. Their needs typically shift from loans and mortgages to savings and investment accounts and perhaps even share investments and possibly business loans. At the end of the family life cycle are retirees. These are consumers whose children have left home and they have stopped working, which means are no longer derive an income from employment. As a result there is limited potential to increase their attractiveness to a bank, but they are key targets for long-term and loyal business. Generally their financial needs shift from loans towards retirement accounts and savings products.